When O’Gara Coach purchased McLaren Beverly Hills, they were committed to giving the brand the O’Gara treatment. This meant improving customer service, integrating branding, incorporating experiential marketing, and giving the brand a proper place to call home within the O’Gara facilities. In 2018 there were many location changes and new additions like Lamborghini and Bentley taking over the historic Clock Tower building on Wilshire Blvd., previously home to Porsche Beverly Hills, Aston Martin getting an entire renovation on Robertson, and McLaren finally getting a location of its own next to Bugatti and Rolls-Royce; the first O’Gara Coach showroom. And who to plan the celebration of this new facility other than Letizia Silvestri and her team of curated vendors. Silvestri first started with transforming the locations courtyard to impress her target audience. This audience tends to be conservative in their late 40s to early 60s but have appreciation for modernism and innovation much like the McLaren brand. Typically the client would recognize this location as where they are able to view vehicle inventory, but on this night they were taken to an all-new place. Upon check in guests were greeted by the girls of Runway Waiters with their futuristic all white cocktail dresses, sleek pulled back hair, and the Bengal Tiger lipstick by Mac that was perfectly matching the signature McLaren Orange. From their waiters were offering the nights signature cocktails branded with the McLaren Beverly Hills logo, service courtesy of The Grand Bevy. This tangible and branded drink is an effortless first impression that Silvestri loves to implement. Also available at the bar with drinks reflecting the vehicles displayed in the courtyard. Guests had the opportunity to view the current product line, displayed in McLaren’s Papaya Spark Orange complemented by Glacier White or even taste. 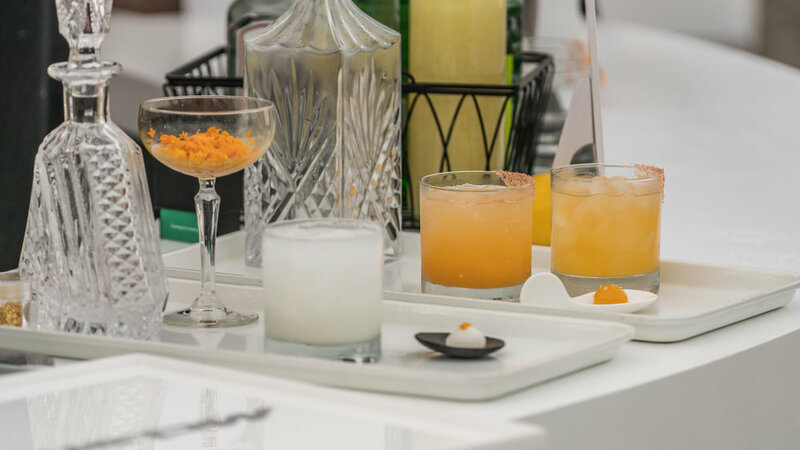 The 570s cocktail was a crisp and aromatic brilliant white cocktail and the 720S a bold, fiery taste with a smoky finish featuring a mango papaya reduction to create the orange color, not to mention the modern choice of the molecular sphere. It was this color combination that was seen over and over again, inspiring every choice. It was again reflected by the outdoor stage, where a creative balloon installation from Belle-Ame Balloons disguised the everyday electrical poles, on the body suits of two contortionists, at the bar where the Grand Bevy created orange drinks, and the bar decor supplied by Tic Tock Couture Florals combined orange flowers and modern greenery. The empty showroom itself was covered with minimal elements inside being a Steinway & Sons piano in an elegant white finish next to a Volcano Orange Black Series McLaren P1, soon to be the epicenter of the night. Before making the grand welcome into the new space, guests had the opportunity to take part in tequila tasting with The Bad Stuff Tequila, champagne provided by Champagne-Billecart-Salmon, on site cigar rolling courtesy of Puro Trader, and relaxing on outdoor lounges provided by Visionnaire to the sound of music mixed by DJ Johnny Hawkes. Also making its way around the night were tasteful snacks on elegantly branded trays, not to mention the touch of orange on every dish; for example snapper crude with local citrus or market vegetable summer rolls with a carrot juice cumin sauce, blood orange pate de fruit or mini chocolate eclairs covered with orange. Though the entire night, the new showroom was left un-assessable to guests, while Rolls-Royce opened their doors as an additional path for guests to explore. At last the peak hour has arrived, and the guests were gathered around the courtyard stage to make a toast led by owner Tom O’Gara and McLaren Brand Manager, Chris Blank along with kind words from Jolyon Nash, the Executive Director of Global Sales and Marketing at McLaren Automotive. As the speeches ended the music began to grow, and the contortionists, with a Cirque du Soleil inspired performance, led the way to the now open showroom to the sound of tribal drums. Inside guests had walking in to find a cyr wheel ballerina, opera singer, and pianist all dressed in white, waiting to put on a performance unlike any other. These performers, and execution of Silvestri’s vision couldn’t have been brought to life without the help of her partners at Zen Arts, always providing excellence. Upon leaving, guests we’re brought back their vehicles by trusted valet company and longtime partner of Silvestri, Chuck’s Parking and Valet service and gifted a beautiful McLaren inspired bouquet again from Tic Tock as well as the all-new collectible Hot Wheel McLaren P1 or F1 to honor the new global partnership recently launched for McLaren Automotive. Catering throughout the night was provided by Lucques Catering while the bars, stage, lighting, and backdrops came from Silvestri’s long standing relationship with Los Angeles’ best, Red Carpet Systems. Photo source: McLaren Beverly Hills Website. Photography by Grubbs Photography and Stephanie Godfrey.